This is another Christmas present I made, this time for my mother in law. I made her a mini quilt for mother's day and said she really liked it and would like more for their new lounge. I wanted to make four and I cut out all my fabric but unfortunately my morning sickness took over and I only managed to make two. I made them the same size but with different designs and using the same fabric's to tie them together. I had a bit of a run with the hexagons and found myself putting them together when ever I had the chance. I want to make more now I feel better. I wasn't happy with the joins in my border, I need to work on this. It's still a bit new to me with the cutting the right size squares and measuring. But practice makes perfect, and I will keep on trying. I hand quilted them which makes them look a bit nicer I think. Again hand quilted. I was happy to make a bit of a dent in my stash for my presents. It also cut costs as it cost me $75 just to send 4 presents to the UK. Next job- using all my vintage sheet stash for a quilt for Ruby's big bed. Although if you live near Sydney there is a great market coming up in Feb called the Stash and Treasure market. Full of everyone getting rid of their stash, vintage to new fabrics. Last time I filled a bag full of fabric for $25. So maybe I might wait till then to start the quilt. Beautiful!! I love the 1930's fabrics. Also the hexagons. 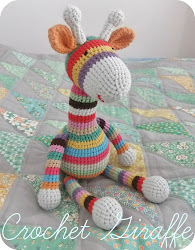 And your giraffe is sooo cute - wow! !